Narendra Kumar Daga was stunned for a minute. “You can’t be serious,” the 29-year-old quipped sarcastically, yet politely, to his employee on a fateful Monday evening in January 1986. His staff had goofed up big time in getting the name of the company registered. “How can you do this?” he thundered, as he broke into a high-pitched rant. Daga was eerily mirroring the behaviour of his idol, who five years back had startled a packed Wimbledon court with his theatrics. A brash young American upstart, John McEnroe entered into a verbal volley with the umpire while disputing a line call. Approaching the umpire, McEnroe reportedly said: “You can’t be serious, man. Chalk came up all over the place.” A few seconds later, he bawled the immortal words again: “YOU CAN’T BE SERIOUS.” Clearly, the young tennis sensation was furious. Back at Bhadrak in Odisha in 1986, a young Daga had thrown a similar fit. He wanted his company to be named after McEnroe. His staff, unwittingly, got it wrong; the ‘e’ in McEnroe was omitted and the name that got registered was McNROE. “I admired McEnroe for his aggressiveness and comebacks,” says Daga, now 61, who has laboriously built an over ₹400-crore company over the last three decades. Headquartered in Kolkata, McNROE is the maker of deodorant brands such as Wild Stone and Secret Temptation. However, what gives the company its claim to fame is not the name of the tennis legend it is named after but the fact that it is the second-biggest deodorant maker in India after Vini Cosmetics’ Fogg. While Fogg with a 16 percent volume market share tops the chart, Wild Stone and Secret Temptation together gave McNROE a share of 9.9 percent during the first quarter of this year. 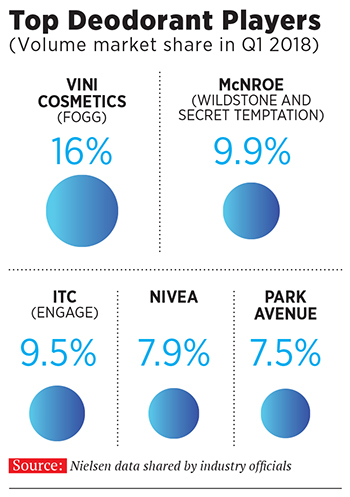 ITC’s Engage and Nivea occupy the third and fourth slots with 9.5 percent and 7.9 percent, respectively, according to data from market research firm Nielsen, shared by industry executives. After running the company for over three decades, and surviving intermittent crises, Daga is now cheering on his son, Ankit, who is mandated with taking the deo brands his father built to the next level. “I am privileged to have such an excellent launch pad, and it is my responsibility now to take it to the next level,” says Ankit, who formally joined the family business in 2016. The induction wasn’t easy. Ankit was confronted with twin problems: For the first time in a decade, revenue had dipped. From ₹338.18 crore in the fiscal ended March 2015, it slipped to ₹303.48 crore a year later. The drop, though not alarming, coincided with a slide in market share, what with McNROE feeling the heat of Fogg’s ‘no-gas’ proposition. Although the Kolkata-based company had rolled out its first no-gas variant of Wild Stone in September 2014—three years after Fogg did —it had not helped much in blunting the competitive edge of the leader. Reason: Fogg was still top of mind for consumers when opting for a no-gas variant, which consists of perfume rather than vaporiser, making it long-lasting. From a high of 7.8 percent in the second quarter of 2015, volume market share of McNROE slipped to 7 percent in the first quarter of 2016. Tied at fourth spot with 7 percent was Park Avenue. The top three players, Fogg, Engage and Axe, had a firm grip on a third of the market. Consumer insight, backed by an Experiential Design team to do research on consumer behaviour, came to Ankit’s rescue. The Indian market, he recalls, was mainly divided between two extremes: One set of consumers who don’t spend over ₹250 on perfumes; and the other that goes the whole hog and splurges on imported perfumes. “We wanted to change the language of selling the fragrance,” he says, adding that the answer to disrupt the market was Wild Stone Code, a perfumed ‘no-gas’ deo that was launched in 2016. A separate sub-brand, with a sharper brand positioning, had an unintended bonus: The product didn’t have to go head-on against the category leader. “We did not want to compete in existing categories,” contends Ankit, who also took another gamble by shunning the traditional black packaging. Though the move to shift to white packs for deos didn’t find many takers internally, Ankit managed to get his father on board. “We got ₹4 crore sanctioned to aggressively advertise the product,” he says. The product and the pack did disrupt. Within two years of its launch, Code became a ₹50-crore brand. What also boosted the prospects of the new product was a sudden shift from a ‘widespread’ product strategy to a ‘sharply-focussed’ one. Earlier, McNROE was all over the place with talcum powder, soap and deos. Ankit brought the focus back on deos by putting soap production on hold. “We wanted to shift all our focus to Code,” he says, adding that talcum powder too was put on the back-burner. In a category like deo, where all the players used to bet big on the mythical sensuality quotient of the product—spray and prey—Wild Stone too pushed the envelope with its own set of provocative advertisements. The game, however, was changed by Fogg with its ‘Kya chal raha hai’ campaigns, as it changed the narrative to functionality. This forced Wild Stone to think out of the box. Early last year, McNROE came up with ‘Kunaaal’ to break the clutter. The theme was set in a house party where the host, an elderly boss, introduces his ravishing daughter to a group of young colleagues. During the conversation, the boss notices and appreciates a tempting fragrance one of the guys, Kunal, was wearing. Next morning, he smells the same fragrance when he hugs his daughter. The father gets furious and shouts Kunaaal…the TVC video ends with a voiceover ‘Log to Notice Karenge’ (people will notice you, obviously). Buoyed by the success of the campaign and the ‘massive likeability’ of Kunal, McNROE followed it up with sequels. “Kunal campaigns became massively popular and changed the perception of the brand,” says Ankit, who overhauled the organisation by building an in-house marketing team, beefing up human resources and setting up a research and development vertical. McNROE is now entering new categories such as men’s grooming products, personal care and perfumes. “The task now is to let McNROE take centre stage rather than individual brands,” says Ankit. The foundation though for the next level of growth was laid by the senior Daga. What encouraged him to take the leap of faith into entrepreneurship was his experience of over eight years in distributing consumer products of companies such as ITC in Odisha, apart from working in the small electrical shop of his father. In 1986, Daga rolled out ‘Heaven’s Garden’ talcum powder, his maiden attempt with brand building. After staying a single-product company for over a decade, he planned his next big move of expanding his product portfolio by launching soap and antiseptic cream. A new factory in Odisha, actress Mandira Bedi to endorse antiseptic cream, and a pan-India TVC campaign were planned in 1999. It, however, came to naught when the state was ravaged by a cyclone. Daga’s factory was washed away and he was saddled with huge debts running into crores. The main priority for the next five years till 2004 was to repay debt and start the journey again. After two years, in 2006, Daga rolled out deodorants and perfume for women by changing Heaven’s Garden into Secret Temptation. The very first year, the brand hit a revenue mark of ₹9 crore. 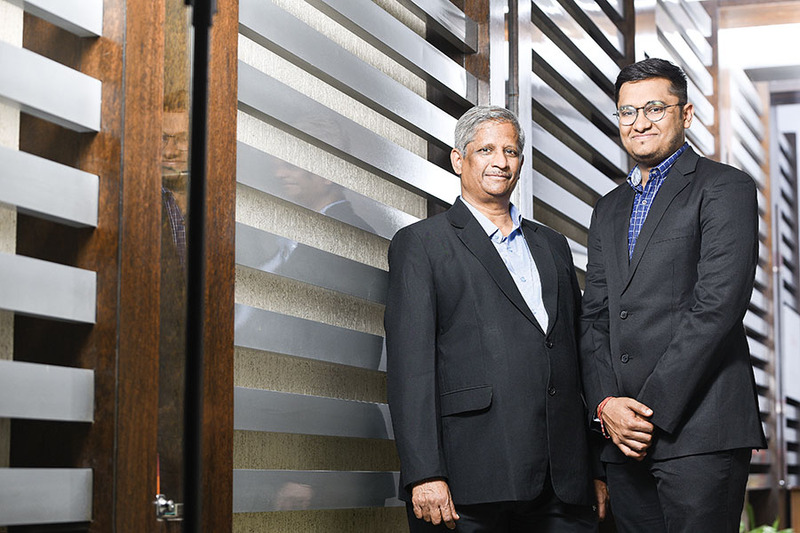 Next year, Wild Stone was launched, which too started with a bang: ₹28 crore revenue in the first year. 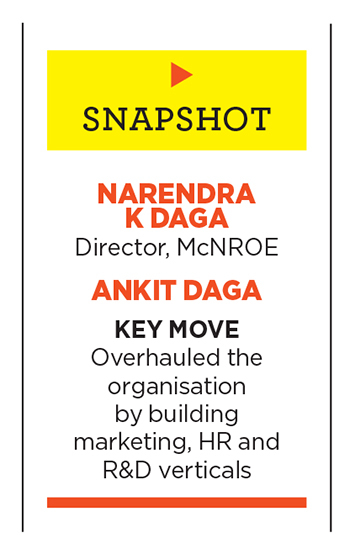 The first major milestone for Daga came in 2009 when McNROE hit ₹100 crore revenue. In close to a decade, McNROE has logged in over ₹400 crore in revenue. For a company that started way back in 1986, contend marketing experts, it has been a creditable journey. “To achieve so much in a tough market is indeed creditable,” avers Jagdeep Kapoor, managing director at Samsika Marketing Consultants. Four strategies, he lets on, have worked for McNROE. One, the focus on mother brands has worked. “Consumers don’t care much for corporate branding,” he points out giving the example of Taj and Jockey, which are more entrenched in consumer minds than Indian Hotels and Page Industries. Two, the communication and advertising helped McNROE cut through the clutter boldly. A strong focus on distribution was also an added advantage. Last, the product delivers what it promises tangibly and intangibly. McNROE, Kapoor contends, has the potential to be a ₹1,000 crore company over the next few years as the new areas of product expansion sync in with the fragrances that they already deal with. Kapoor, however, sounds a word of caution. “The biggest challenge is to stay focussed and not get diverted from the fragrance category,” he says.